This is a repost from Huffington Post. Happy New Year - and happy new you! Time to take stock of your joints, your gut, and your wallet. The latter includes the biggest source of wealth most of us will ever have – Social Security. For a young family, the insurance value of Social Security is worth about $200,000. We pay for Social Security benefits by paying the FICA tax, which is 12.4% of earnings split evenly between the employer and the employee up to a 2018 cap of $128,400. Ninety-five percent of us will pay FICA all year long because our annual earnings fall below the cap. However, it is because of this cap that the highest earners in America will stop paying the FICA tax before the end of the first week of January 2018. For example, the top-paid executive at Charter Communication (he makes $98 million a year and got a 500% raise last year) stopped paying by noon on January 1, right about when the ibuprofen kicked in to nurse New Year’s Eve hangovers. The CEO of CBS earned $68 million last year, a 22% raise from the year before, and will stop paying FICA tax by your first day back at work on January 2 (if you aren’t among the millions working on the New Year’s Day). This game – ‘when do rich people stop paying for Social Security?’ – could go on forever. We can have fun with the calculations: who will finish paying by their first coffee break of the day? After brushing their teeth? The earnings cap means that people earning the highest salaries (the top 1% is about 133,000 people earning an average of $2.5 million per year) pay into Social Security as if they only earn $128,400 per year. Their Social Security benefits are also calculated as if they make only that amount. Every year, this cap means that over $2 trillion dollars of earnings escapes Social Security tax. This happens not by design, but by accident. According to Kathleen Romig of the Center for Budget and Policy Priorities, in 1983, Social Security reformers never imagined we would see such a rapid increase in earnings above the cap, nor did they imagine that the bottom 94% of earnings would experience wage stagnation during the 1990s and 2000s. According to the Economic Policy Institute, those earning the highest incomes would enjoy all the earnings gains of the last 40 years. Of the many policy instruments available to help the middle and working class gain security by rewarding hard work, taxing earnings over the cap for Social Security is one way Congress can address the lopsided growth of income for the lucky few. Social Security is in good shape and well funded. However, the program will only have enough money to pay ¾ of benefits in 2027 unless the system obtains about $300-$340 billion per year starting in 2028 or a cool trillion now, according to the nonpartisan Congressional Budget Office. To benchmark what $300 billion means, the President and Congressional Republicans passed an unpopular tax bill that cut federal revenue by over 4 times what Social Security needs – by 2028, 83% of the $1.5 trillion tax cut will go to the top 1% of taxpayers. Let’s review: Social Security needs $300 billion and $1.2 trillion of the benefits of the recent tax bill went to the top 1% of taxpayers. Karen Smith at the nonpartisan Urban Institute argues that raising the earnings cap could ensure Social Security’s financial strength. Because raising the cap would mean only a few of the highest earners pay more, it is unlikely to inhibit overall economic activity. The richest people in America would not lose their social status or economic well being, though they and their employer will pay, on average, $300,000 more in Social Security taxes. They will still have the same power, influence, and goods and services. The biggest impact is that Social Security will be solvent. We could also collect revenue for Social Security from income that is currently not counted as labor income. The richest 20 Americans – including four members of the Mars candy family members and three Waltons - likely earn at least 6% per year in dividends, interest, and capital gains on their wealth, or $45 billion. The lowest 21 million earners also earned $45 billion. The top 20 richest people in the United States earned $22 billion per year each on inherited wealth and other non-labor sources of income. They did not pay any Social Security tax on that income. In contrast, the bottom 21 million earned $2,000 per year each on average and paid 6.4% of Social Security tax. However, if these billionaires paid Social Security tax on all their income, the Social Security system would instantly have 10% more revenue. The Retirement Equity Lab at the New School for Social Research (where I am the director) has documented the retirement crisis in America. We need comprehensive pension reform, but private pension reform will not work unless we also shore up and expand Social Security. The first step is to right the wrong of lopsided earnings growth and raise the earnings cap. We should also tax some financial capital to strengthen and expand Social Security. The vast majority of Americans of all ages, income levels, and political affiliations are opposed to Social Security benefit cuts in any form. Tax increases are the most popular way to fix Social Security among the American public. However, the tax increase will face significant opposition from the 5% or so of Americans whose incomes top that ceiling, as the tax hikes are much larger for the very highest earners. A National Academy of Social Insurance survey reports that 77% of Americans feel it is critical to preserve Social Security benefits for future generations, even if it means raising taxes. Among respondents, 81% agreed that they don't mind paying taxes into Social Security "because it provides security and stability to millions." This includes majorities of every age group, income level, and political affiliation. Solving the retirement crisis by shoring up pension income is the best policy idea for the new year. Eliminating the Social Security earnings cap is unlike the sugar and spending austerity resolutions you made: this policy is very little pain and all gain. Economist Teresa Ghilarducci, one of the nation’s leading experts on retirement security, and Blackstone President Hamilton “Tony” James today announced the publication of their co-authored book, Rescuing Retirement: A Plan to Guarantee Retirement Security for All Americans, at a reception hosted by Michael Bloomberg. The book outlines a deficit-neutral proposal to ensure that all workers can save enough to retire through mandated, individually-owned, and effectively-invested Guaranteed Retirement Accounts. Left unaddressed, the authors emphasize, the strain of a newly poor population of senior citizens would devastate federal, state, and local budgets for decades to come. Universal coverage: Every American worker would have their own Guaranteed Retirement Account, ensuring consistent retirement savings throughout their career. Individually owned, effectively invested: Unlike Social Security, workers keep ownership of their assets through transparent individual accounts. As with traditional pension plans, their assets will be pooled and invested in long-term, strategies that generate higher returns than current 401(k) plans. Deficit-neutral and costless for families at or below median income: The plan redeploys current tax subsidies more evenly across the income distribution, and uses existing Federal payment infrastructure, avoiding a negative impact on the budget. Guaranteed lifetime income: Upon retiring, savings will be returned through life-long payments, guaranteeing a continuous standard of living as long as retirees live. Bipartisan appeal: This model keeps accounts under personal control, distributing savings based on the amount invested, not based on income, and without impacting the budget or raising taxes. The publication of the book coincides with the launch of a website dedicated to the plan and its promotion, rescuingretirement.org, and a social campaign driven by the hashtag #fixretirement on Twitter and Facebook. “This book should be required reading for everyone concerned with how Americans will fund their retirements and makes a compelling case that it should include us all. It is an important conversation starter in an area that will only get more relevant in the years to come,” said Austan Goolsbee, Former Chairman, White House Council of Economic Advisers. “At a moment when America's retirees are caught in the middle of a political tug-of-war, James and Ghilarducci offer a new way forward. Rescuing Retirement proposes a provocative yet practical solution to America's pending retirement crisis,” said Alan Krueger, Professor of Economics, Princeton University and Former Chairman, White House Council of Economic Advisers. “Clear, thoughtful, and engaging. This book is a must-read for future retirees, policymakers, and anyone concerned with our nation's future,” said Christian Weller, Senior Fellow, Center for American Progress. “We may have philosophical differences, but the plan put forth by Teresa and Tony provides a bold, refreshing approach to modernizing America's retirement infrastructure,” said Bill Jansien, CEO, StoneHedge Global Partners and member, Federal Retirement Thrift Investment Board. Teresa Ghilarducci, economist and director of The New School’s Retirement Equity Lab (ReLab), and Hamilton “Tony” James, president of Blackstone, have combined their academic and business expertise to advance a powerful reform idea—Guaranteed Retirement Accounts (GRAs). Outlined in their new book, Rescuing Retirement, GRAs are individual retirement accounts that would provide universal coverage, low fees, and professional investment management. 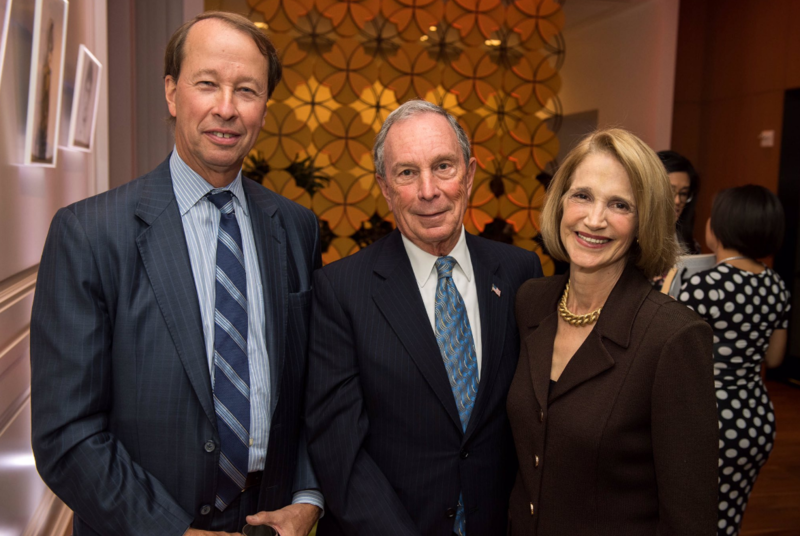 On Tuesday, September 20, 2016, POLITICO's Ben White hosted co-authors Teresa Ghilarducci and Blackstone President Tony James for a "Cocktails and Conversation" event featuring their new book, Rescuing Retirement. The event welcomed representatives from the media, government, industry, non-profits and advocacy groups as stakeholders in the need to solve the retirement crisis. Ghilarducci and James, left, shared their book and proposal for Guaranteed Retirement Accounts (GRAs) with House Minority Leader Nancy Pelosi. Ghilarducci and James are working to lift up the efforts of 27 states working to provide a retirement plan for all Americans. The GRA would provide all workers with a safe place to earn higher rates of return than in a 401(k) and ensure workers a stable income for the rest of their lives. The Bipartisan Policy Center's (BPC) Commission on Retirement Security and Personal Savings, of which I am a member, today released its comprehensive report on retirement security. Today's recommendations are both a recognition of an awaiting crisis and a sign of hope for a better future. Without changes to our failed system, a growing number of Americans will ride a wave of insufficient savings to deprivation in their old age. More than half of American households who are near retirement have less than $12,000 saved. The number of 65-year-olds per year who are poor or near poor between 2013 and 2022 will increase by 146%. This report takes the first steps toward reform by recognizing the principles necessary to create effective retirement savings vehicles. The Commission's call for Retirement Security Plans to pool resources and decrease administrative burdens supports the need for economies of scale and universal access. The call to expand myRA and create a nationwide minimum-coverage standard supports the need for mandated participation and a shared responsibility between employers and employees. The call for a lifelong income plan supports the need for annuities to ensure seniors don't outlive their savings. Growing inequality has made retirement increasingly available to only a few. We need a federal plan that serves everyone. With 27 states actively pursuing retirement reform, these leaders have made it clear that the political will for change exists. 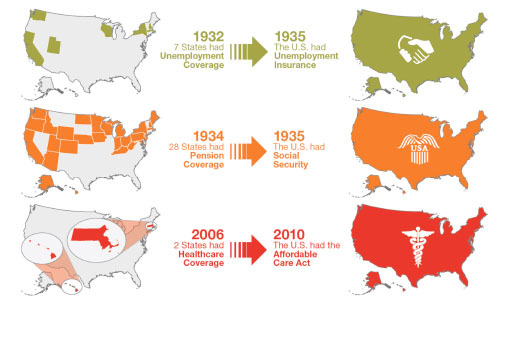 Historically, we have relied on state innovation to spur federal action. As with Social Security and healthcare (see image), this report recognizes that federal legislation is necessary to provide employers and employees consistency and portability across states. The Commission recognizes the failure of our current system and sets us on the right path to reform. However, it does not claim these recommendations, even if fully implemented, will solve the retirement crisis. I look forward to taking the next steps toward comprehensive reform through supporting Guaranteed Retirement Accounts (GRAs). A joint policy proposal issued with Hamilton "Tony" James of Blackstone (from the diverse backgrounds of academia and investment banking), GRAs would provide savings accounts that advance the same principles in the Commission's report. By creating individual accounts on top of Social Security with mandated contributions from both employers and employees, these accounts would pool investments, guarantee a return, and provide lifelong annuity payments. The report also put forward reform measures for Social Security. I made a joint statement with my fellow commissioner Alan Reuther on Huffington Post, "A Better Way to Fix to Social Security," to discuss our disagreement with some of the recommended policies. I thank the Bipartisan Policy Center for their hard work supporting the commissioners throughout the two-year effort that created today's report by the Commission on Retirement Security and Personal Savings. I also express my gratitude and appreciation to my fellow commissioners for their tireless efforts on behalf of American's retirees, present and future.